There are two ways of approaching this disc. One could consider it a hotchpotch of pieces without any connection, apart from being written by one and the same composer. But one can also enjoy the disc as an interesting overview of some of the genres Alessandro Scarlatti tackled. The choice is yours. There are two pieces which throw rare light on aspects of Scarlatti's oeuvre. The first is the Toccata for harpsichord in A. The harpsichord is mostly associated with Domenico rather than with his father Alessandro. But if one wonders where Domenico's talent came from here is the answer. Alessandro's keyboard music is much more than 'pupil fodder' as it is characterised in New Grove. It is of remarkable quality and several features of Domenico's harpsichord style are prefigured in his father's keyboard music. The Toccata in A, well played here by Matthew Dirst, should encourage the listener to explore this repertoire. I would like to recommend here recordings by Alexander Weimann (ATMA) and Rinaldo Alessandrini (Arcana). The instrumental music is also one of the lesser-known aspects of Alessandro's oeuvre. Not that it is completely neglected: in particular the Sinfonie di Concerto grosso and the Sonatas for recorder and strings are performed and recorded now and then. But there are still compositions which are hardly known, and the three sonatas for cello and bc are among them. I can't remember having ever heard them, which is a shame. The Sonata in c minor is a very nice piece in four movements, which is performed here with verve. The artists pay much attention to the strong contrasts in tempo between the movements. The second, an allegro, is played at high speed, but excellently articulated. The closing presto is very short, and therefore the allegro is repeated after it. That is a rather odd decision for which there is no justification whatsoever. The disc opens with a specimen of the genre Alessandro Scarlatti was most famous for: the chamber cantata. He wrote more than 600 and it isn't very hard to find a cantata which hasn't been recorded before. That is the case here with 'Euridice dall'Inferno', in which the soprano in three pairs of recitatives and arias describes Euridice’s feelings during her stay in the underworld, expressing her longing for Orpheus to come to collect her. Melissa Givens has a rather bad start, singing the first recitative with too wide a vibrato, even though she sings it with good expression. But the next aria is a lot better: she keeps her vibrato under control and sings the text in an expressive way. The rest of the cantata is at the same level: Ms Givens sings the recitatives with the right amount of rhythmic freedom and adds some nice ornamentation in the dacapo arias. She is well aware of the fact that ornamentation in a dacapo isn't just an opportunity for the singer to show her skills, but also a way to emphasize the 'affetti' of the aria. From that angle the extended ornamentation on the first word of the second aria, "non", makes sense. I could have imagined some stronger dynamic shading, for instance on "fuoco" (fire) in the first aria, by means of a 'messa di voce'. The last pair of recitative and aria are the highlight of the cantata and of the performance: the strong emotions come out very well. The largest piece on this disc is an oratorio. Scarlatti wrote quite a number of oratorios and in recent years several of them have been recorded. But all of these are longer works on an Italian text which in character differs little from the operas. 'La concettione della Beata Vergine' is different in that it is rather short and its text is in Latin. In this respect it reminds me of the oratorios which Giacomo Carissimi wrote in the middle of the 17th century. Stylistically the work is up to date, though, as Scarlatti makes use of the dacapo form in the arias, as in the previous cantata. In his programme notes Matthew Dirst writes that the sources suggest this oratorio has probably had a predecessor, a somewhat longer work that has got lost. He also refers to some incongruities between text and music, which suggests someone else has put the music of Scarlatti to a new text. The subject is the immaculate conception of the Virgin Mary, a doctrine which was highly controversial in the early 18th century and not universally accepted. Pope Clement XI put an end to the debate as he made the Feast of the Immaculate Conception a holiday of obligation in 1708. He knew Alessandro Scarlatti well as both were members of the Accademia of the Swedish Queen Christina, who had settled in Rome after her conversion to Catholicism. Through this acquaintance Scarlatti could have been encouraged to write an oratorio on this subject. Whereas oratorios on Italian text were becoming more and more substitutes for the opera - whose performances were forbidden during Lent - this oratorio completely links up with tradition in which this form of music was considered a perfect vehicle to spread the message of the Counter-Reformation. The four soloists represent four characters: the archangel Michael (soprano), Gratia (grace - alto), Haeresis (heresy - tenor) and Serpens (the serpent - bass). As usual the oratorio consists of two parts, and contains a sequence of recitatives and short arias, plus some duets and a trio. Even though text and music sometimes are in conflict this is a nice piece which deserves to be performed. Generally speaking the soloists give good performances. Only the bass has some problems with the top notes in his recitative 'Sile, gratia, sile'. But in his next aria he shows his great expressive skills. This aria also has a very beautiful basso continuo part which is played with considerable drive. The duet of tenor and bass, 'Fida comes sum', and the alto aria 'Sydera micabant' are also done rather well. The instrumental ensemble performs at the same level, although I noticed some intonation problems in one of the violins now and then. As I said, there are two ways of approaching this disc. Although I would have liked a bit more coherence in the programme I am glad that these particular pieces have been recorded. In particular the two vocal items are fine additions to the growing catalogue of Scarlatti's vocal music. The interpreters have certainly succeeded in bringing the music's quality into the limelight. 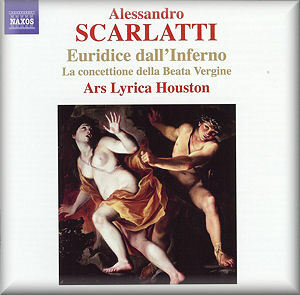 Lovers of Alessandro Scarlatti's music in particular should not overlook this disc.